These BMW F22, F30 or F32 Carbon Fiber Mirror Cover Replacements feature high quality construction that's complete with a clearcoat to maintain shine and prevent damage from road debris. These covers simply install over your existing mirror covers and offer an appearance upgrade for those enthusiasts not looking to go all out on their car. The RW Carbon F30 Mirror Replacements are crafted from durable ABS plastic and is then overlayed with real 3k twill weave carbon fiber. Matches perfectly with carbon fiber kidney grilles, front lip, and trunk spoiler on your vehicle. 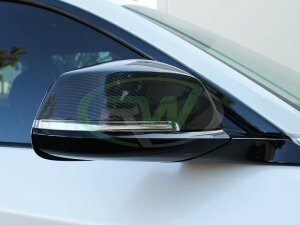 Choose RW Carbon for your F22/F30/F32 exterior carbon fiber accessories and get a great fitting and looking product the first time. NOTE: These are replacements mirror covers and take the place of the existing one. Not mirror cover overlays.